As Monty Python was fond of saying, â€˜And now for something completely differentâ€™. For a start, the venue is not actually the Viaduct-housed 53 Two theatre space but a marquee pitched on the tarmac outside. The stage set, of a bar, is actually a working public bar; opening half an hour below the show and both manned and frequented by the cast (complete with poker tables). 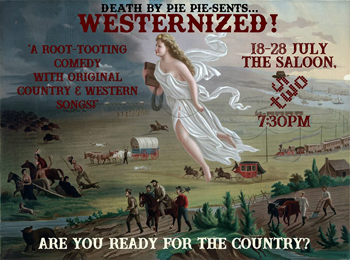 Unfortunately, due to a spot of rustling by some low down, good-for-nothing, lazy, cheatinâ€™ varmints, the only whisky being served is Scotch and not Bourbon but the music is naturally country and so by the time the show proper commences, the audience has already been truly â€˜Westernisedâ€™. What is your best life? The self-help shelves of book shops are full of definitions whilst advertisers are constantly telling us how their products can help us achieve it. 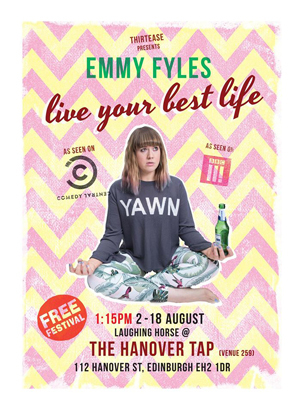 Can a whole industry of therapists and councillors really advise us on how to get it and are we convinced by images of both celebrities on TV and people we know on social media seeming to have it? With this premise, has put together a very comprehensive exploration of all these questions. In theory, the problem with having a play where the main theme is everything going wrong is that, if anything doesn't actually happen as it should, nobody among us poison pen-wielding reviewers will notice. Then again, maybe that's exactly the point. 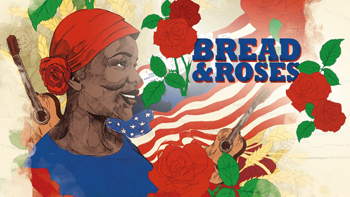 Bread and Roses is the first musical premiere for a little while at Oldham Coliseum, offering an interesting blend of authentic Salvation Army hymns and American blues and soul protest songs. The story follows real historical events in the year 1912 which, whilst largely unknown on this side of the pond, are startlingly reminiscent of events in England a century before and whilst not exactly Americaâ€™s Peterloo massacre, many parallels are clearly evident. 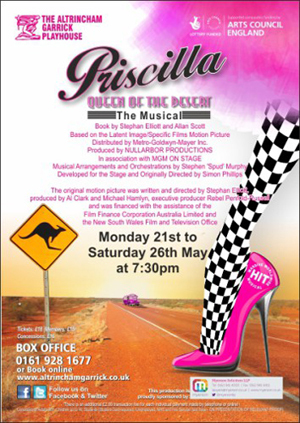 The beautiful renovated Altrincham Garrick Theatre hosted the flamboyant musical Priscilla Queen of the Desert, a particularly risquÃ© script for the locals full of glitz, glamour, glitter and sexual connotations. Directed by the talented Joseph Meighan, a young producer who seems to turn everything he touches into gold, this may have been an amateur show, but make no mistake there is absolutely nothing amateur about this production and I certainly was not prepared for the magnificent ingenious masterpiece I was about to witness. 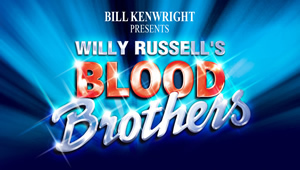 Willy Russellâ€™s long running successful musical Blood Brothers graced the Palace Theatre in Manchester. 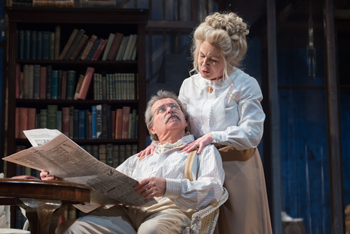 I canâ€™t imagine that there are many people who donâ€™t know this infamous storyline as it has been performed by amateur and professional actors and actresses on numerous stages and venues throughout the UK and worldwide for more than 3 decades. Willy Russell was born in 1947 in Whiston, Merseyside, into a working class family with an alcoholic father and a mother who worked in a warehouse. He grew up around very strong women relatives who later influenced him to write about believable convincing Liverpudlian female characters in the 1970â€™s such as Educating Rita, Shirley Valentine and Mrs Johnstone in Blood Brothers. 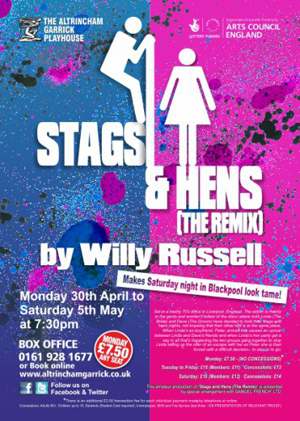 I was intrigued to see how this â€˜remixâ€™ of Stags and Hens had changed from the original staging in the 1980â€™s. Russell originally wrote Stags and Hens in 1978, and was first published in script format in 1986. He adapted 75 percent of the original script in 2008 to produce 'Stags and Hens - The Remix'. 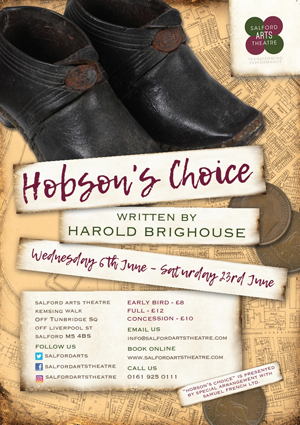 In this new script he has sharpened the pace and added modern lines appropriate to the present day, and included a lot more swearing but has kept the storyline and the period intact. 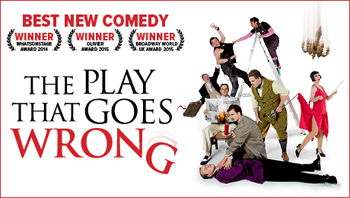 The play is set in 1977 rather than present day because stag and hen parties are more commonly hosted abroad nowadays and not in back street night clubs in the UK.